Roy Roberts Cappe was a single man from Allegheny County, Pennsylvania and was born on the 20th August 1917. 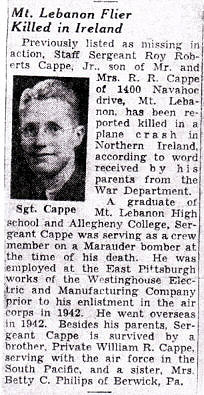 A Graduate of lebanon High School and Allegheny College he enlisted as a Private in the Air Corps on the 10/1/42 at Pittsburgh, Pennsylvania and his Army serial number was 39458692. At the time of the accident Roy was 26 making him the oldest member of the crew. Before enlisting he worked as an accountant and auditor at the East Pittsburgh Works of the Westinghouse Electric and Manufacturing Company. Records indicate that Roy was not a regular member of the crew. He was attached to the 364th Service Squadron, 39th Sevice group, Toome as an Aerial Engineer on "Flying Status". 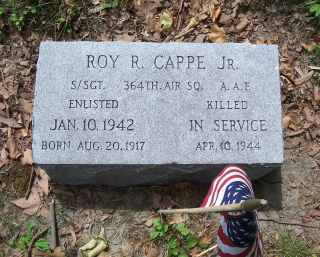 Roy Cappe was originally buried on the 20th April 1944 in Lisnabreeny American Military Cemetery, Rocky Road, Belfast, Plot B, Row2 Grave No6. In 1947 the cemetery was decommissioned and his remains were exhumed and upon the request of his family repatriated to the United States. Roy Roberts Cappe Jr is now buried with his parents in Allegheny Cemetery, Pennsylvania section 28-lot 378, grave 3. I believe the reburial took place on the 24/7/48. Roy Cappe's older brother, William Rinehart Cappe Sr, served as an Airborne Cryptographer during World War II and was involved in the taking of Guadalcanal. He also enlisted at Pittsburgh, Pennsylvania on the 14/7/43. 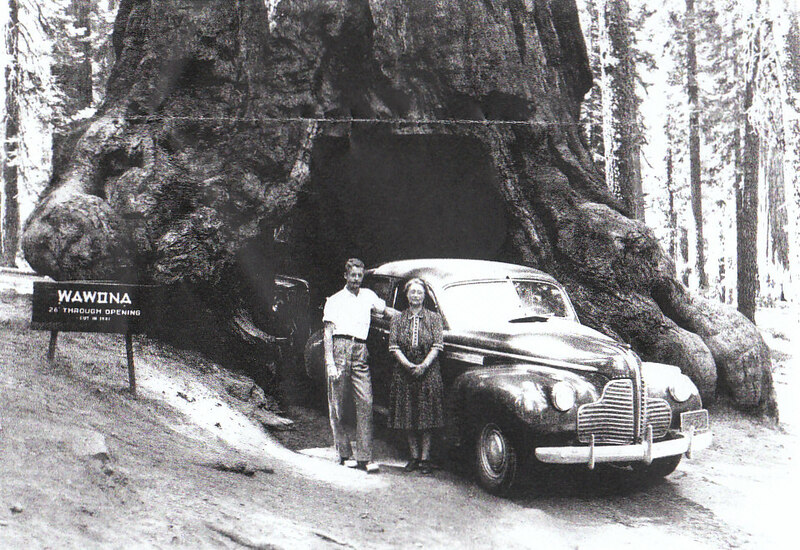 Roy and his Mother Gerzie, Yosemite State Park. This copy of Roy Cappe's Obituary was forwarded to Gary McFarland by Roy's Nephew Bill Cappe.